Cleaning a mountain bike involves taking care of some intricate details, and while this has to be done right, we sometimes and up doing more harm than good because we clean our bikes incorrectly and too often. Your bike needs to be pretty dirty before you even consider washing it, and if it is, then you are set for a wash. Gather your tools, grab your hose, find a nice spot, and get ready for the cleaning. It is an excellent idea to have brushes of different sizes the big ones will work well for general scrubbing while the small ones will help with getting into the hard-to-reach spots. A clean, correctly lubed drive train will look better, move better and extend the lifespan of your bike’s most significant parts. Preferably you have to do washing after every muddy or dusty trip. Dirt, sand and other gritty impurities act like sandpaper on your bike, slowing wearing down parts with every turn of the crank. 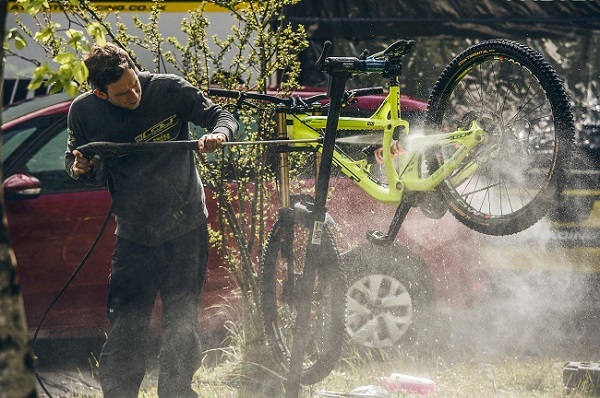 The following are the tips on how to clean a mountain bike. Get your hose and rinse off any mud and excessive dirt as best as you can without spraying too much water onto the disc brakes and into places that have bearings as the water can wash out the grease in the seals. After rinsing, get your brushes and soap out and start scrubbing the bike from front to back taking care to leave out sensitive areas such as dropper posts and stanchions which should be wiped down with a clean sponge. Scrub your bike gently, rinsing the brushes regularly to avoid scratching your bike with any grit, then rinse the whole bike lightly just to remove the soap before it dries up. An error many beginners make is to use a high-pressure pipe when cleaning a mountain bike. Though this does excellent work at washing off dirt and debris, it also does an excellent job of washing away grease and lubrication that is critical for ideal performance. 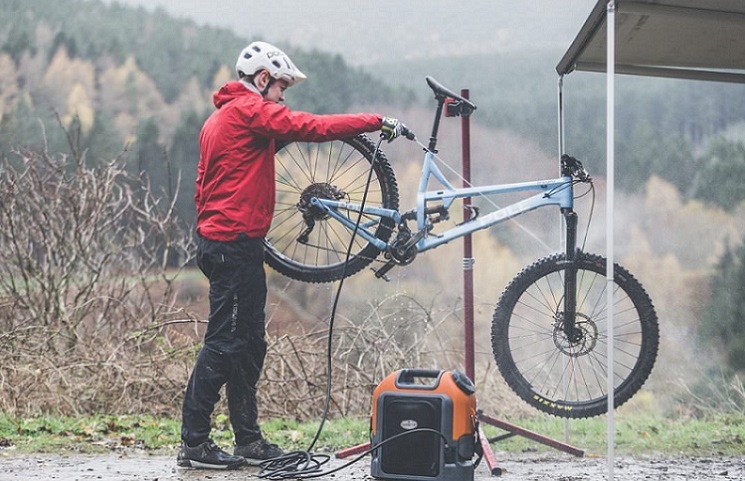 One of the most valuable parts of your budget friendly mountain bike is the external drivetrain and it deserves some special care when cleaning. A good bike cleaner and some soft bristles that will not damage any sensitive parts will take care of the grease and filth that is usually present on the drivetrain and includes the cassette and the chainrings. Once the drivetrain is taken care of, clean your suspension but avoid the brakes at all costs because the bike cleaner will harm and wear them away. Get your lube and work on the front suspension, and the rear absorber, while not letting any lube get near the brakes. Pump the suspension to get rid of any grit or extra lube which may be present and which you need to clean up with a cloth. 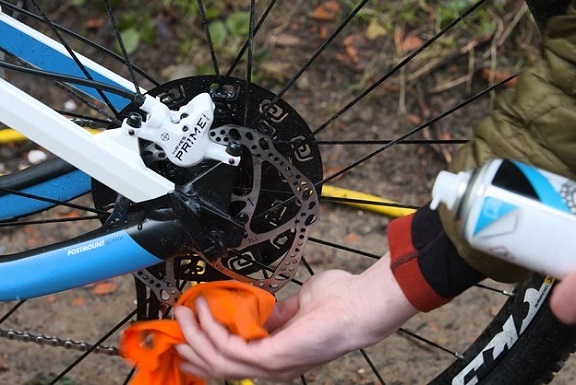 For the drivetrain, backpedal your bike a bit to check that no water is left then add lube to the chain, and each derailleur pivot; get rid of any extra lube with a cloth once you are done, all the while avoiding the disk brakes. If your bike is dirty, you need to remove some of its parts to do a full cleaning. Clear your handlebars by eliminating any fittings attached and position your bike upside-down. From there you have to remove the wheels as well. When all dry and set, reattach the wheels and lubricate the drivetrain. Position your bike the right way up and reattach the accessories that you removed earlier. The disk brakes are simple; use a bit of water or better yet, some disc brake cleaner, followed by a good wipe and drying with a soft cloth. When the brushing is done, it is time to rinse the whole bike making sure to point the water spray down to avoid splashing any loosened grime and oil onto the disc rotor. Bounce your bike a little to get rid of any excess water then dry up the bike with a soft and highly absorbent rag, paying extra attention to the drivetrain components which need to dry off completely. If you can perceive your hands on a compressor, you can use an air gun to blow-dry your drivetrain while making sure not to blow any grime onto the rotor. Next, you want to wipe down the parts with a rag to get any gunk left over and remove excess water. 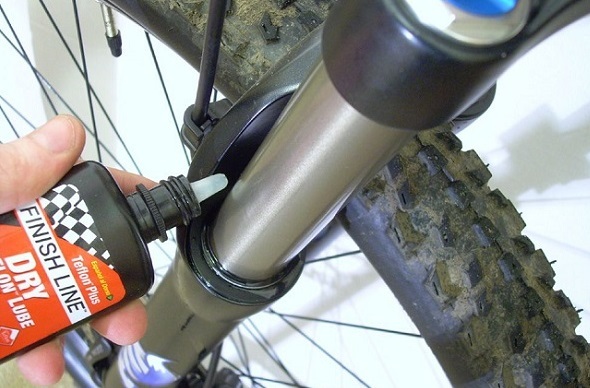 Wait until the drivetrain is thoroughly dry and then smear your favorite wet or dry lube. A wet lube like Pedro’s Syn Lube is typically best for wet or muddy situations, and a dry lube like Pedro’s Ice Wax is well for dry, dusty conditions. Be careful when using a wet lube only apply a small amount. Using a lot of wet lube can attract more dirt and filth and wear out parts even faster. One essential part of cleaning up the bike is to grease the chain afterward. Most people do not do this, and it results in an intensely shorter lifespan for both the chain and the gears. If you have never lubricated a chain before, it is not a bad idea to ask someone at a bike workshop to show you how or get a tune-up and make sure that they take a few minutes to explain to you about chain lubrication so that you can do it by yourself in the future. Now that the cleaning is done you can put your bike away, or you can check your tire pressure, bolts, and bearings, and be on the road in no time. If you like a finer finish you can give your bike frame a nice polish before putting it away. You may also consider stripping down your bike from time to time to give it a complete clean but if you wash it properly all the time then this will not be necessary often. In conclusion, it is significant that your bike does not remain wet for long. You want to avoid rust at any cost since once it starts, it is tough to overcome. If you are not self-confident in your bike maintenance abilities, it may be worth to take your time to get a tune-up and have the bike professionally cleaned. This may not seem cheap but will almost surely be very competitive as related to replacing your bike. Test if everything is running well and you are don. Your good mountain bike is now ready for another set of riding action.